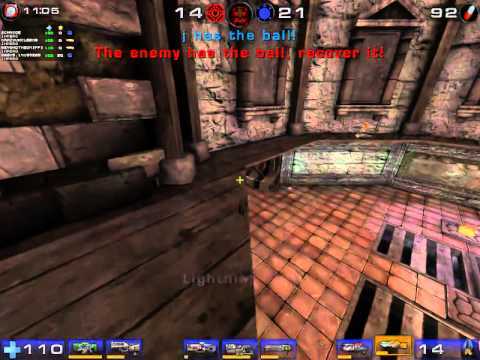 My initial, and currently only desire/plea, is for a fast, team-based, soccer-like gametype similar to UT2004's Bombing Run to be remade/re-created(by Epic). Bombing Run has a substantial amount of speed and tactical/strategic depth that isn't found in any other gametype. There's a ball, 2 goals, 2 ways to score(3 points for shooting the ball into the goal, 7 points for carrying the ball into the goal). There's passing, offense, defense, midfield; play it any way you like! But to score, you must play as a team, and focus on moving the ball to the goal(passing and receiving to/from teammates), instead of simply trying to kill the other team by yourself. Timing and coordination/strategy are more important than aim here! A strong defense(aim) can be very useful, of course, but strong offense is what scores goals. A day to learn; years to master - no brainless deathmatch here! * * * If you want to see the return of a gametype like BOMBING RUN(or an exact remake! ), please post your thoughts here, and keep this thread alive! * * * If anyone wants to PLAY BR(or make new maps!) with us, here is our forum, and the UT2004 BR server name is CrazyUncleBob(Texas, US), and "corny'sUT2004ServerBR"(Deutschland, Earth). Bob's @ 10PM EST every Tues/Thurs/Fri/Sun, Corny's proserver Sunday's(and maybe Wednesdays?) exclusively(pros ONLY). See you there! Last edited by CT007; 05-21-2014, 03:13 PM. Not that bombing run/jetball/hutball isn't an amazing game type but it has major issues in terms of spectating and playing in tournaments. The majority of these come from the nature of the maps. Spawn areas are in each teams base. This often leads to people spending more time running around the map trying to catch the action rather than being in action. This is bad for spectators and players alike. After looking at bombing run and discarding it I have proposed an alternative game mode here. Now yes I have described using a flag but you could easily change this to a ball and have a goal if you think it would add a bunch. What do you think about combining to two modes? By this i mean 1 ball but only 1 goal. Take ball to outside of map or designated area to enable your team to score. Scoring similar to what u mentioned above. Last edited by SaunaCowboy; 05-08-2014, 04:54 PM. I love Bombing Run, but I'd rather see something more along the lines of OVerload in UC2. I completely disagree with what you said about BR & spectating. There is more possible exciting action in BR than you'll ever find spectating in DM, for example. DM/FFA(non-duel) is just too 1-dimensional. I'm not a CTF fan myself(too slow/hard to follow? ), but I will check out your link after I get home from work! Oh I don't disagree that spectating objective based game types is more fun that spectating non objective based game types (TDM/FFA although not duels). That said I think both CTF and Bombing run involve a lot of unnecessary down time. Also basically my link is basically half court (basketball) style capture the flag. The idea of combining them would be half court style bombing run so essentially 1 base bombing run. It really was a fun game mode, though not too popular. I would really focus on getting DM/TDM/CTF right as a base, then adding Onslaught and VCTF, for their popularity and fun, and later adding Instagib, BR, Freezetag and whatever makes the game more varied and fun. I think part of the problem with Bombing Run in UT 2004 was the general failure of on-foot game types in UT 2004. That same idea would have rocked and been popular in UT99. The only problem in UT was getting back to the ball. See FragBall. I'd rather see assault with team launching and hammer jumps back in. Now -there- is something that takes years to master. I am convinced there was no skill ceiling. You should start a thread on this. Thing is assault game mode is easy to mod into the game or add later. What I think you really want is the crazy brokenness of UT99 team launching. This is also what made UT99 CTF great. The ability to launch ur teammate or translocator. I would love to see bombing run return. The majority of these [issues] come from the nature of the maps. Agreed, most of the vanilla bombing run maps in UT2k4 were far too large, and ended up slowing down the pace of the game significantly. Often times, the mode transformed into "VIP" where the entire team would just cluster around the ball carrier. I think the mode would work quite well on smaller maps and with a few tweaks. Last edited by magus96; 05-08-2014, 11:06 PM. ...it has major issues in terms of spectating and playing in tournaments. I also think that if Epic cared about tournaments, they would have made 'UnrealCon' years ago :\ I'm assuming that non-"classic" style gametypes won't get much attention in this game, sadly, because they are too far away from the "classic" core(for a small team project). But what can you do. My all-time favorite Total Conversion/mod is the original Defense Alliance for UT, but who's gonna bother making all those monsters, skins, and animations for it?! I think your thread explaining your proposed alternative game mode is pretty confusing, without any videos or supporting graphics. It sounds like Bombing Run played in a tiny DM-based arena map...not the way it should be played(unless you're into that low grav, fast movement, instagib UT2003 stuff). Wha..? What was the problem? Not enough flags? =p What do/did you primarily play? BR is my main gametype, definitely, but I've played a lot of Last Man Standing and recently freon(in Unreal games, at least). For those of us who haven't played/liked any console since N64, please tell us what this 'Overload' gametype is.